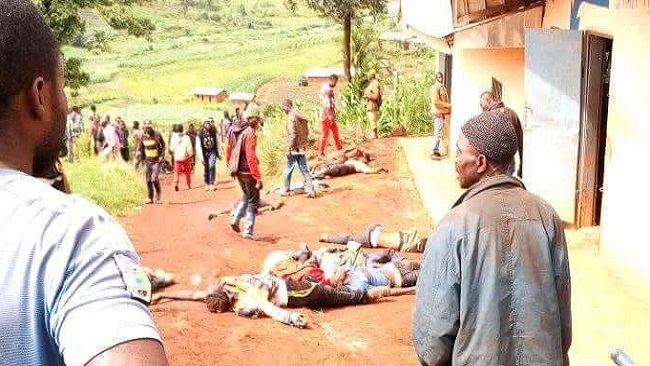 Cameroon government forces have killed at least 30 Southern Cameroons civilians in Menka- Pinyin in the Northern Zone outside Bamenda, while another Biya regime attack on a small settlement in the Southern Zone of Mbalangi left 22 dead. The death toll came a week after the US ambassador Peter Barlerin called on President Biya to stop the senseless killings of Ambazonians and to step down. In Santa Sub Division, the Anglophone Minister of Territorial Administration, Paul Atanga Nji reportedly planned and ordered government forces to use conventional explosives on innocent civilian population, a senior Roman Catholic clergy said. The assault is part of an indiscriminate campaign by President Biya’s forces to retake control of the territory now known as the Federal Republic of Ambazonia. Cameroon Intelligence Report sources in Bamenda noted that there are no doctors to treat patients for severe gun wounds. The Communication Secretary of the Southern Cameroons Interim Government, Hon. Chris Anu who confirmed the genocide currently going on in the Santa sub constituency said the toll is expected to rise. The spokesperson for the Ambazonia Self-Defense Council Restoration Forces said it had identified 42 bodies so far. Exhausted and shell-shocked Southern Cameroons civilians have fled into the forest. An 83 year old woman interviewed by our correspondent in Santa said she had gone three days without food. Others said the Francophone army had hoarded food and humiliated civilians, even shooting people trying to leave. The UN offices in Yaounde and Calabar have warned of a humanitarian crisis in Southern Cameroons and in the Federal Republic of Nigeria. The assault on Southern Cameroons for over two years now has devastated more that 72 towns and villages across the territory and damaged and destroyed more than a dozen schools. At least 1,500 Southern Cameroons civilians have been killed.